VDOT holds design public hearing on Feb. 27 for citizens to give comments. About 100 people attended a VDOT design public hearing on the widening of Rolling Road on Tuesday, Feb. 27, 2018 at Irving Middle School in Springfield. Photo by Steve Hibbard. VDOT representatives Andrew Beacher, Nicholas Roper, and John Maddox address the crowd. (Click on "Download .JPG" to see large map.) A map that shows the widening of Rolling Road. (Click on "Download .JPG" to see large graphic.) 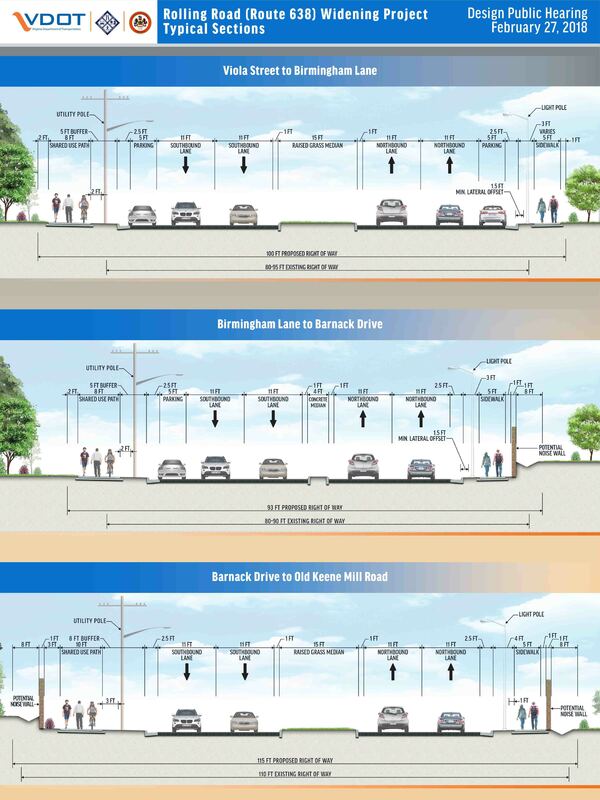 A graphic design that shows typical sections of the Rolling Road widening project. The Virginia Department of Transportation wants to spend $51.6 million to widen 1.4 miles of Rolling Road (Route 638) from two to four lanes from Viola Street to Old Keene Mill Road. That includes a shared-use path for bicyclists, pedestrians, and other non-motorized users in Springfield. The purpose of the widening is to help relieve congestion, increase capacity, improve safety, and expand mobility for all users. Experts are forecasting from 20,000 to 40,000 vehicles per day on Rolling Road in the near future. About 100 people attended a design public hearing on Tuesday, Feb. 27, 2018 at Irving Middle School to hear from VDOT on design features, look over documents and maps, and voice their concerns over how the widening would affect them. The project includes a new traffic signal at Greeley Boulevard, an additional left-turn lane, and a right turn-lane at Old Keene Mill Road. The estimated cost includes preliminary engineering at $5.9 million; right-of-way acquisition/utility relocation at $17.4 million; construction at $28.3 million; for a total cost of $51.6 million. The project is being financed with federal, state, local, and Northern Virginia Transportation Authority funds. Phase II will see Rolling Road widening from two to four lanes between Viola Street and Old Keene Mill Road, and signal upgrades, pedestrian and bike facilities and improvements to access management will be added. Specific changes from Viola Street to Birmingham Lane include on-street parking along the northbound and southbound sides; and a raised 15-foot wide grass median. Changes from Birmingham Lane to Barnack Drive include on-street parking along the southbound side; a raised four-foot wide concrete median; and 12-foot high noise walls along the northbound side. 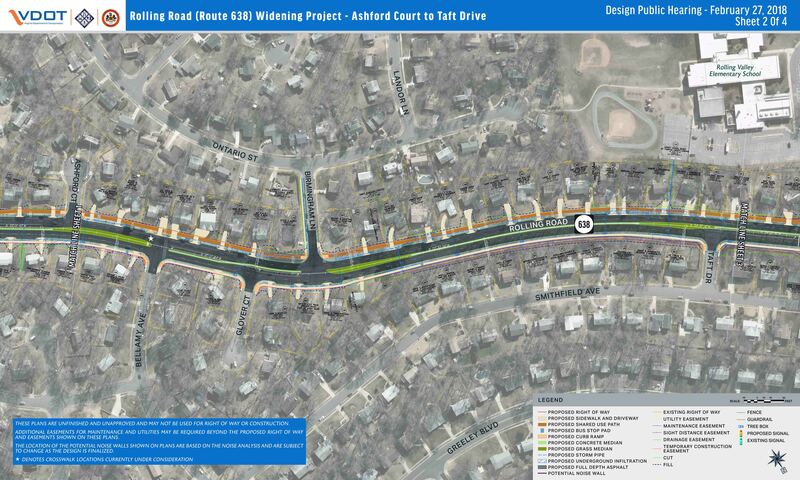 Specific changes from Barnack Drive to Old Keene Mill Road include a raised 15-foot wide grass median; and noise walls along both sides to Rivington Road. Property owners who benefit from the noise walls would get to vote on them – but not everyone gets to vote. THE SCHEDULE for the right-of-way impacts for Phase 1 is the Fall 2018; and the Phase II is Winter 2019. The utility relocation will begin in Spring 2019 for Phase I; and Winter 2020 for Phase II. Construction is slated to begin in the Fall 2019 or Winter 2020 for Phase I; and Fall 2020 for Phase II. After the presentation, residents voiced their concerns on everything from safety to cost to how it would affect their property values. Ricardo Sepulveda, who lives on Rolling Road, said VDOT is turning Rolling Road, a neighborhood road, into a highway system. “This project began under the premise of being a four-lane expansion – it went from two to four, plus a turn lane – that’s five; plus two lanes for parking – that makes it seven; plus a bike path; and all of a sudden, you have eight or nine lanes. So, the neighborhood will cease to be,” he said. She’s also concerned about the exit; to make a turn, they exit Regal Oak Drive and are forced to go to Kenwood Avenue into the parking lot because they aren’t permitted to make a U-turn. “[Turning] right is not a problem, but left is a major problem, and now we’re going to have double the impact – we’re going from 20,000 to 40,000 people a day. How are we going to get across?” she said. RESIDENTS can send comments about the design, which are subject to public disclosure, via email to meetingcomments@vdot.virginia.gov. Project information shared will be available online atwww.virginiadot.org/projects. The comment period ends March 9, 2018.